Notes: The Type 1 shuttlecraft was undoubtedly one of the most important shuttles of its time. With the introduction of the transporter, Starfleet had come to believe that the day of the shuttlecraft was over, and by the mid 2220's it had begun phasing these craft out of service. Design and production of shuttles was abandoned in 2233; the total number of shuttles in Starfleet declined from some 850 in 2235 to less than 200 in 2245; of these, over 90% where in service with facilities or vessels too small or unimportant to have received transporter systems yet. By 2249, Starfleet was beginning to have second thoughts about this policy. The transporter had proved to be somewhat less reliable than had been hoped, especially when operating in the presence of even moderate levels of radiation. It was hoped that improvements to the basic technology would soon correct this problem. 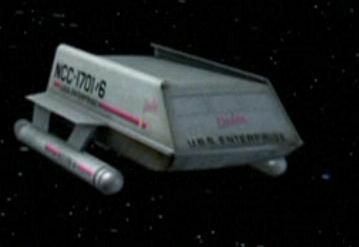 In addition, the transporter had a range limit of some 30 - 40,000 km; while many confidently predicted that this figure would soon be greatly extended, even to interstellar distances, Starfleet reluctantly decided to produce a new shuttle design to 'fill in the gap' until this new technology arrived. Starfleet previous shuttles had been given letter designations, with the H-model shuttle being the last into service. This time around the designers decided to mark the last ever shuttle design by switching systems, and the Type 1 shuttle prototype was duly launched in 2251. The design was a simple boxlike structure with a small engineering compartment at the rear and control position at the front. A pair of nacelles gave the craft considerable warp capability, as it was thought that once the transporter eliminated the need for orbit-to-surface and interplanetary missions, only the interstellar tasks would remain until these too where eliminated by the expected interstellar transporters. Modest shielding and weapons capability where designed in, but the Type 1 was never intended to serve any serious combat role. Since it was expected to be retired within a decade or so at most, little effort was made to design the Type 1 to last. The craft was produced in limited numbers only, and only selected ships and facilities where equipped with the craft. Of course, the interplanetary and interstellar range transporter never materialized-and in fact the transporter continued to be quite unreliable when presented with new operating environments. By 2263 Starfleet belatedly realized that its 'stopgap' shuttle had now been in service for over a decade; crews where still complaining of the problems lack of shuttles was causing them, and there was still no sign of the expected transporter technology revolution. Starfleet finally caved in and decided to end what frustrated Starship crews had taken to calling "the shuttle drought". Increased production of the Type 1 was initiated, the long, costly, and unproductive project to develop the interplanetary and interstellar transporters where quietly abandoned. Despite this new attitude, it was still some time before the shuttle drought was finally ended for good. As late as 2266 frontline Starships where often equipped with only one shuttle, or even none at all. This situation did gradually improve, however, and by 2270 all starships once again had a full shuttle complement. Production of the Type 1 continued until 2275, when it was terminated in favour of the Type 3. The last of the Type 1's where retired in 2291.